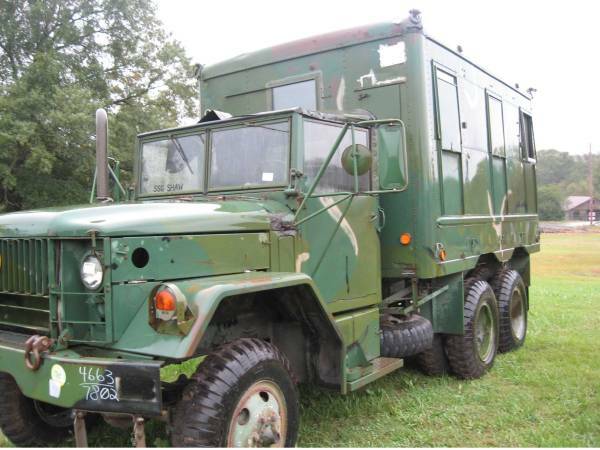 Military surplus 6x6 turbo DIESEL TRUCK shop van, with less than 13,000 miles. No known serious problems. Original military cost, $94K. Has built in windows with shades, electric lights, wiring, breaker box, plugs, etc Manual transmission, heavy duty axles, suspension, etc. Originally a electronic repair shop box van. The truck runs good, lots of power. Great hunting or farm truck or repair shop truck, but geared too low for economical highway use but great off road. The top speed is about 55 MPH. What kind of low millage heavy duty all wheel drive diesel box truck can you get for $11,900? If you don’t want the box I will keep the box and subtract $4500 from the price. I would also trade part of the trucks value for a good hunting stuff. Other trades might be considered, like a tractor or disc, but at least 1/2 of the trucks value must be cash, I have some big bills to pay. Parts, motors, transmissions, etc. for these trucks are readily available and cheap from many sources on the internet. You should be able to keep these trucks running for many years for very little money. NOTICE... The gov is scrapping perfectly good trucks for metal value which is disgusting. Write your congressman, that is taxpayer money ..They will probably become very rare. THE PHONE NUMBER I LISTED on here IS A FAKEnumber... I DON"T Want my real number shown on craigs because of scammers.. This truck cannot be exported or sold to a non citizen. I ONLY ANSWER EMAILS THAT CONTAIN A PHONE NUMBER. THERE ARE TOO MANY SCAMMERS THAT JUST WANT YOUR EMAIL ADDRESS. I WILL REMOVE THE LISTING AS SOON AS IT IS SOLD, SO DON’T TRY TO SCAM ME BY ASKING IF IT IS STILL AVAILABE IN A ATTEMPT TO GET MY EMAIL ADDRESS.